Can your blood type determine the way you should eat to have better health and a fuller life? Well some people believe it can. And one of them is Dr. Peter D’Adamo. He is a very famous neuropathic medic and in his book Eat Right for Your Type: The Individualized Diet Solution for Living Longer, Staying Healthy & Getting Your Ideal Weight he describes the idea. 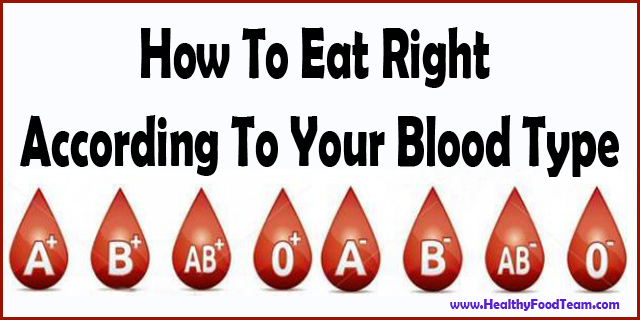 Here is a summary of what he says on how you should eat according to your blood type. Some experts disagree with this method of nutrition, but since his book was published, the more than 7 million sold copies worldwide speak for themselves. D’Adamo’s theory says that each person has its responses to food, which are closely connected with our blood type. He says that lectins (carbohydrate-binding proteins) can correspond to different blood type in a different way. It can be extremely dangerous on your health if certain lectins get in contact with certain blood type. Dr. D’Adamo closely explains these side-effects and changes in his book, but, his main goal is to analyze which foods are appropriate for each blood type and the amount in which they should be consumed. Twenty thousand years ago, when agriculture was developing, this blood type had the change of a lifetime. This means that people with blood type A should concentrate on living a vegetarian way of life – this people are also known as “the agrarians”. Because it’s one of the oldest blood types, dating from more than 30 000 years ago, it requires a protein-filled nutrition, unlike any of the other blood types. The people that are blood type 0 are also known as “the hunters”. The people from this blood type are known as “the nomads” because they possess the quality to be quite adaptable to dairy products and have the most versatile digestive system of all. It first appeared ten thousand years ago. Since this is the newest blood type, their diet varies between Blood type B and A. Because this blood type is just a thousand years old, the people are called “the enigmas”. If you do not know your blood type, it can easily be determined for you by your medic or physician.